ELISSA DORFMAN Artist Statement - My main emphasis has been to create my own way of painting. I had the basics, but went into new areas by instinct. I painted Egyptian paintings in the early 1970s. Then I worked on paintings I call Consciousness Art. For example, portraying how the land and water looked 100 years ago compared to today. There was a period in which I painted Native American Indian Art and learned about their culture. From the early 1970s I developed my own style that I called Expansionism. Beginning of Expansionism by Elissa Dorfman Description: From the early 1970's I developed my own style that I called Expansionism--everything I sense I expand (that certain something, hunch, instinct, thoughts, feelings, emotions, beliefs). The inner dynamics (the inner world) of the subject expand beyond its outward appearance, and into the environment (divine matrix, the field, nature's mind, mind of god, quantum hologram). Two places science got it wrong. 1. The space we believe is empty is really not. It is full of a living material, pulsating essence. 2. We may experience inside of our bodies that influence the world beyond through the conduit in this space. Then I went into Scientific paintings of molecules, genes, cells, etc. My whole life, I have worked on color combinations and strived to perfect my technique. I am about to enter another phase of my career. I create art because I feel the need to and enjoy it. Elissa is in many private collections throughout the world. She has a wide range of subjects, erotica, fantasy, humor, interiors, landscapes, moods, nature, patterns, people, places, and still life. Elissa's Artist File at The Getty Research Institute, Wilhelm Arntz Collection, Special Collections,Thomas J. Watson Library, The Metropolitan Museum of Art, The Museum of Modern Art MOMA Queens Artist File, Smithsonian American Art Museum/National Portrait Gallery Library Artist File, "Library of Congress" Washington, D.C. Prints & Photographs. Elissa is a member of, Artist Equity, New York City, Visual Artists And Galleries Association, (VAGA) New York City, National Museum Of Women In The Arts, Life Member Of Art Students League N.Y.C., The Society Of Arts Academy, United Kingdom Elissa Dorfman creates contemporary oil and watercolors paintings in abstract realistic and figurative style. She has exhibited around the world in many galleries and museums. Tokyo Museum, Museum de Luxembourg Paris, France Ny Carlsberg Glyptotek Museum Copenhagen, Denmark and others. 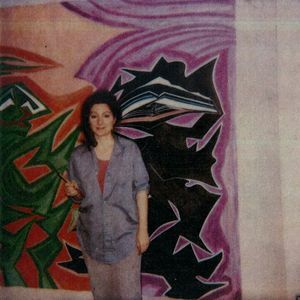 Elissa has been in group and benefit shows with Andy Warhol, Willem & Elaine de Kooning, Lichtenstein, Rauschenberg, Rivers, Krasner, Soyer, Appel etc.